In 1971, Stan Jay M’67 co-founded Mandolin Brothers in Staten Island, a company that became one of the world’s top sellers, buyers, and restorers of fine new and vintage American guitars, banjos, and mandolins. All kinds of aficionados and collectors, as well as great musicians including Joni Mitchell, George Harrison, Bruce Springsteen, and Bob Dylan — to name just a few — have visited Mandolin Brothers’ unassuming storefront. Up until his death on October 22, 2014, Jay made sure his customers’ dreams were fulfilled with the right musical instrument. There are many fine guitar stores in New York City — in Manhattan. How did Jay come to place his world-famous shop in Staten Island? 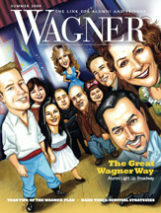 Wagner plays a large role in that story. In 1965, the New Jersey native finished his undergraduate degree in English and education at Penn State and came to Wagner for a master’s in education. 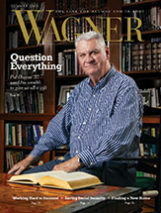 He knew a lot about Wagner because a close high school friend, Bob Zentmaier ’66, was a Wagner economics major. The two bonded over their love for music; they met in Hillside (N.J.) High School’s mixed chorus. Zentmaier’s brother owned Rondo Music in Union, New Jersey, where Jay worked during his summer breaks and bought his first guitar. So it’s no wonder that, according to a 1989 letter Jay wrote to the Wagner director of alumni affairs, education wasn’t all he was up to during his graduate studies. Jay went on to pursue an Ed.D. at Columbia’s Teachers College, while also developing his knowledge of vintage fretted instruments and their value during this time of the folk music craze. 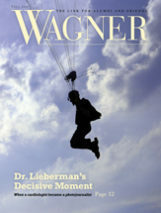 By the way, it was yet another Wagner alumnus who influenced Zentmaier to choose Wagner: Edward Monkman ’58, economics teacher at Hillside High School. Mr. Monkman died in 2010, and Zentmaier reports that he and Jay lamented never having thanked him. “He got both of us to Staten Island and changed our lives,” says Zentmaier. Stan Jay M’67 holds a limited-edition guitar he designed with the Martin Custom Shop in 1997. “This guitar’s radiant physiognomy can cause the conversation to cease at any gathering into which you bring it; yea, its sound can make other players stagger back in awe, wide-eyed and slack-jawed,” he wrote in his customarily effusive sales copy when offering one for sale at Mandolin Brothers.